The hotel is easily accessible from Istanbul Ataturk Airport, only 20 min (19 km / 12 miles) away - Taxi service and tram to Sultanahmet is available. After taking the Atu-Yenikapi tram from the airport, you will be connecting at Zeytinburnu station to Eminonu Kabatas direction, departing at Cemberlitas station. The hotel will be walking distance 800 meters. The hotel is 45 km away (app. 75 min) from the Sabiha Gokcen Airport. You will have to cross the bridge of Fatih Sultan Mehmet and view the city and the Bosphorus while crossing from the Asian side of the continent to the European side. You can either take the Havatas shuttle (every 30 min) to Taksim and take a taxi onward or if you prefer to travel with ferry you can take the bus E11 to Kadikoy Express and take the Sirkeci Eminonu boat, and the tram to Cemberlitas station from the pier. 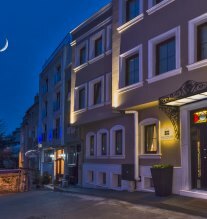 The hotel is very close to all the historic places of the old city of Istanbul and the city center.